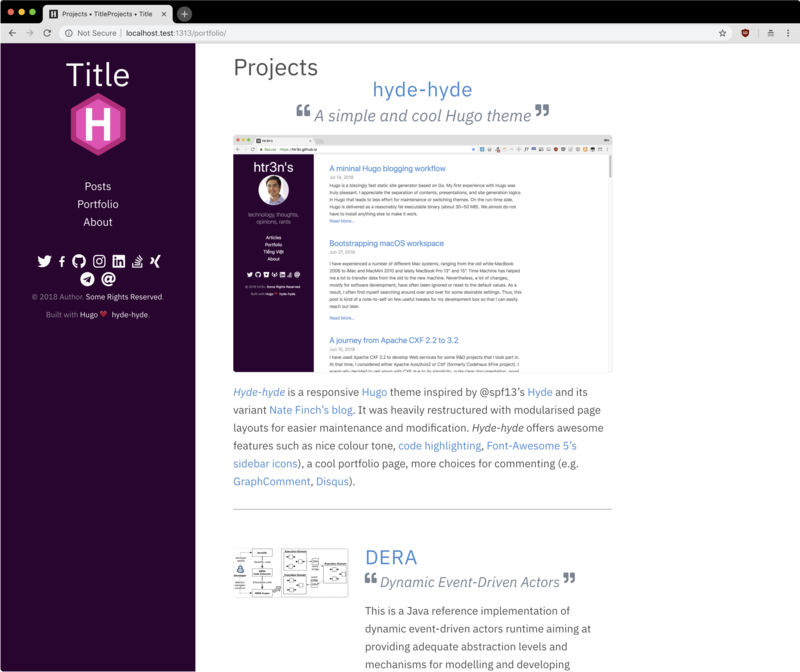 Hyde-hyde is a Hugo’s theme inspired and derived from @spf13’s Hyde and Nate Finch’s blog. Since version 2.0, hyde-hyde has been overhauled and, therefore, might cause some disruptions. Per PR [#45 by @jd4no, hyde-hyde can use SCSSs directly in the templates instead of the generated CSSs. 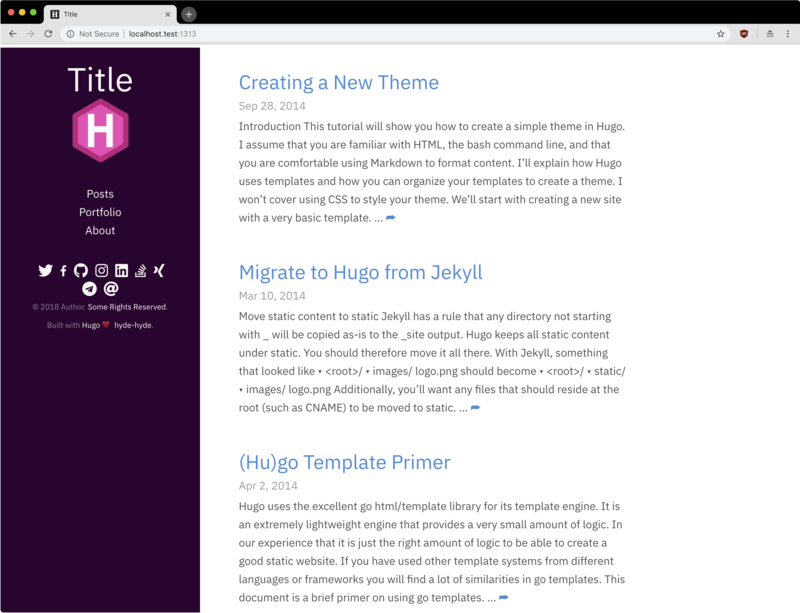 The generated CSSs and the generated resources are still kept in hyde-hyde in order to ensure the demo on Hugo theme site working. For more details, please refer to CHANGELOG. A real site in action can be found here and its WIP source for reference. After that, choose hyde-hyde as the main theme. That’s all. You can render your site using hugo and see hyde-hyde in action. highlightjsstyle="highlight-style": only when highlightjs = true, please choose one of many highlight.js’s styles. relatedPosts = false|true (default false): Setting to true allows related posts. Please refer here for more details on related contents with Hugo. GraphCommentId = "your-graphcomment-id": to use GraphComment instead of the built-in Disqus. This option should be used exclusively with disqusShortname = "disqus-shortname". UtterancesRepo = "your-repo-name": to use Utterances instead of the built-in Disqus. This option should be used exclusively with disqusShortname = "disqus-shortname". [params.social]: in this section, you can set many social identities such as Twitter, Facebook, Github, Bitbucket, Gitlab, Instagram, LinkedIn, StackOverflow, Medium, Xing, Keybase. toml [params.social] gravatar = "your.email@domain.com"
Most of the customisable SCSS styles in assets/scss/hyde-hyde and Hugo templates in hyde-hyde/layouts are modularised and can be altered/adapted easily. Since version 2.0+, I added a portfolio page just in case. If you need it, simply add a menu section ‘Portfolio’ in config.toml as following. In the folder content , create a subfolder portfolio and use the following folder/content structure as reference. The remaining of _index.md will be ignored. Here is a longer summary of the project. You can write as long as you wish. featured: true : when you want to show a project as featured project. It is default to false. Note that only one project should be marked featured: true , otherwise, the result could be random as the Hugo template will take the first one. The body of the Markdown file will be the summary of the project. 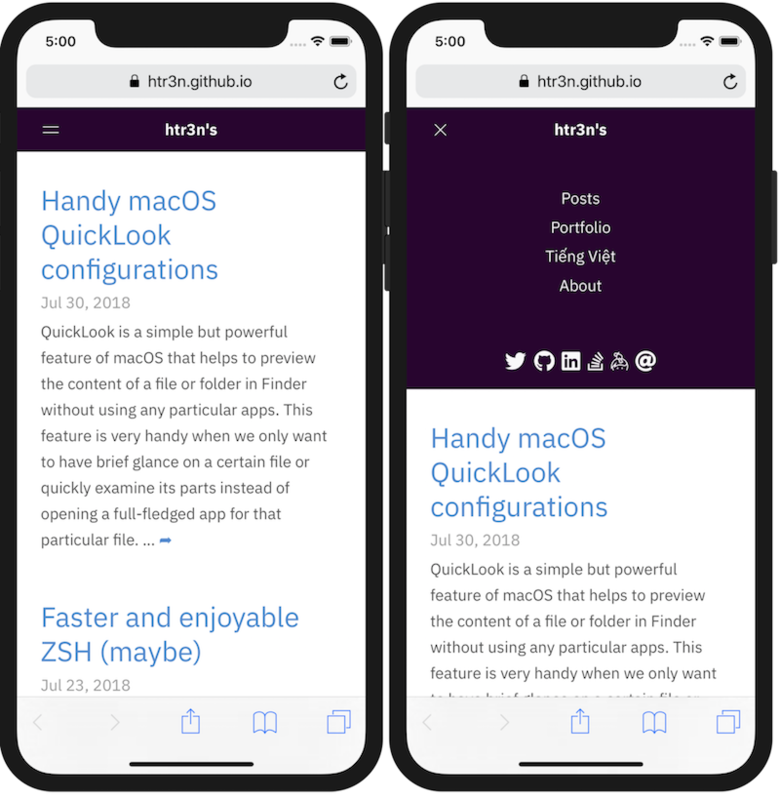 If you want to adjust the portfolio page to your needs, please have a look at the main template, that uses this partial template and this SCSS style.